Fall River, MA – Patients of Saint Anne’s Hospital Regional Cancer Center and their families now have a new, centralized resource to meet their unique needs. The new Patient Resource Center at Saint Anne’s Hospital provides a dedicated space for a range of activities, services, materials, and information most sought by the cancer program's patients and their families. a SHINE (Serving the Health Insurance Needs of Everyone) counselor to assist Saint Anne’s Hospital patients who are Massachusetts residents with Medicare. Administered by the Massachusetts Executive Office of Elder Affairs Services, SHINE’s services include health insurance counseling, information and assistance. The center also now houses the cancer center’s Women’s Boutique. Through the American Cancer Society, the boutique provides wigs, scarves, hats, and other items in a private space and at no cost for patients who are experiencing hair loss due to cancer treatment. Open Monday-Friday, the center is open to all patients of Saint Anne’s Hospital Regional Cancer Center. 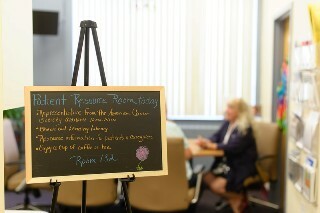 It is located in the Hudner Oncology Center at Saint Anne’s Hospital, corner of Forest and Osborn streets, Fall River. Some services require an appointment. Free valet parking is available at the center’s entrance on Osborn Street. Founded in 1976 at Saint Anne’s Hospital, Saint Anne’s Hospital Regional Cancer Center provides nearly four decades of cancer care expertise with the convenience of a community setting to patients in the Greater Fall River-Greater New Bedford area. With locations at the Hudner Oncology Center at Saint Anne’s Hospital, Fall River, and Saint Anne’s Hospital Regional Cancer Center-Hawthorn Oncology Center, in Dartmouth, the center offers comprehensive medical oncology and hematology care; radiation oncology services provided by physicians from Brigham and Women’s Radiation Oncology, who also hold appointments at the Dana-Farber Cancer Institute and Harvard Medical School; access to national clinical trials; and related professional and patient/family support services. Saint Anne’s Hospital Regional Cancer Center is nationally accredited with commendation by the Commission on Cancer of the American College of Surgeons as a comprehensive community cancer program and unconditionally accredited in radiation oncology by the American College of Radiology.